You may be surprised to learn that my first love was archaeology. I always imagined a treasure lay buried just under the old abandoned houses I explored as a child. Somewhere along the way in high school, my interest in science turned into an appreciation for medicine as a career. My mind has always enjoyed the mystery behind how our human bodies function and have the ability to heal from tremendous injury or insult. 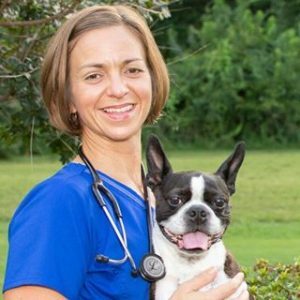 I started college with the intent to pursue physical therapy or medical school but, after a medical crisis with my own dog, I knew I wanted to find out more about veterinary medicine. I began learning about the various career paths provided by veterinary medicine and knew this was the field for me. My practice as a general practitioner presents me with new experiences and opportunities to problem solve each day. Performing physical exams in the comfort of the pet’s normal environment allow me to gather the most accurate information in order to be able to help my patients. Taking time to get to know an owner allows me the ability to discuss and develop medical care options that work for both the pet and the owner. My goal every day as a veterinarian is simply to make the lives of pets and their owners better and to end the day knowing that I made a positive difference in an animal’s life and the people around them. Born and raised in eastern North Carolina, I moved to Raleigh in 1999 to attend veterinary school at NCSU CVM. Go Wolfpack! In 2001, I moved to Holly Springs with my husband and we haven’t left because we like the area so much! We love the feel of a small town just outside of a metropolitan area. I live in Holly Springs with my incredibly loving, supportive extrovert-of-a-husband Jeffrey Tyrone (keep in mind opposites attract and it is important to note that I am an introvert unless speaking to my clients about my patients) and my two sons, Samuel and Isaiah. We are a family that loves basketball, music, being outdoors (okay, I love being outdoors and my family tolerates it) and embracing our fears (for example, kayaking in alligator-infested water and going over swinging bridges). Of course, our family would not be complete without animals, and ours includes a three-legged cat named Shelby and two dogs, Molly and Tommy Lebron. Yes, Lebron James is our favorite basketball player and our own LeBron rose above some pretty tough obstacles to become a star all of his own amongst the Streeter family. All animals graced our presence via wonderful rescue groups and we would not have it any other way. Though never did I know how much a white beagle mix could shed nor how stubborn a pit mix could be! We LOVE them all dearly. As such, I look forward to getting to know you and your family. What better way to do that than in the comfort of your home. It is my privilege to care for your pet and to bring excellent veterinary treatment right into your living room. I believe in tending to your pets as if they were my own and to enable you to be the best pet parent possible!